1 A None No Power Seat 1 A is a standard Business Class seat located at a bulkhead. The seat transforms into a fully flat bed. The proximity to the galleys may be bothersome. 1 C None No Power Seat 1 C is a standard Business Class seat located at a bulkhead. The seat transforms into a fully flat bed. The proximity to the galleys may be bothersome. 1 D None No Power Seat 1 D is a standard Business Class seat located at a bulkhead. The seat transforms into a fully flat bed. The proximity to the galleys may be bothersome. 1 G None No Power Seat 1 G is a standard Business Class seat located at a bulkhead. The seat transforms into a fully flat bed. The proximity to the galleys may be bothersome. 1 H None No Power Seat 1 H is a standard Business Class seat located at a bulkhead. The seat transforms into a fully flat bed. The proximity to the galleys may be bothersome. 1 K None No Power Seat 1 K is a standard Business Class seat located at a bulkhead. The seat transforms into a fully flat bed. The proximity to the galleys may be bothersome. 10 A None No Power Seat 10 A is a standard Business Class seat located at a bulkhead. The seat transforms into a fully flat bed. The proximity to the lavatories and galley may be bothersome. 10 C None No Power Seat 10 C is a standard Business Class seat located at a bulkhead. The seat transforms into a fully flat bed. The proximity to the lavatories and galley may be bothersome. 10 D None No Power Seat 10 D is a standard Business Class seat located at a bulkhead. The seat transforms into a fully flat bed. The proximity to the lavatories and galley may be bothersome. 10 G None No Power Seat 10 G is a standard Business Class seat located at a bulkhead. The seat transforms into a fully flat bed. The proximity to the lavatories and galley may be bothersome. 10 H None No Power Seat 10 H is a standard Business Class seat located at a bulkhead. The seat transforms into a fully flat bed. The proximity to the lavatories and galley may be bothersome. 10 K None No Power Seat 10 K is a standard Business Class seat located at a bulkhead. The seat transforms into a fully flat bed. The proximity to the lavatories and galley may be bothersome. 11 C None No Power Seat 11 C is a standard Business Class seat that transforms into a fully flat bed. 11 H None No Power Seat 11 H is a standard Business Class seat that transforms into a fully flat bed. 15 A None No Power Seat 15 A is a standard Premium Economy Class seat located at a bulkhead. The seat has additional legroom. There is no floor storage for this seat during takeoff and landing. The tray table and inflight entertainment monitor are in the armrest, making the armrest immovable and slightly reducing seat width. 15 C None No Power Seat 15 C is a standard Premium Economy Class seat located at a bulkhead. The seat has additional legroom. There is no floor storage for this seat during takeoff and landing. The tray table and inflight entertainment monitor are in the armrest, making the armrest immovable and slightly reducing seat width. 15 D None No Power Seat 15 D is a standard Premium Economy Class seat located at a bulkhead. The seat has additional legroom. There is no floor storage for this seat during takeoff and landing. The tray table and inflight entertainment monitor are in the armrest, making the armrest immovable and slightly reducing seat width. 15 E None No Power Seat 15 E is a standard Premium Economy Class seat located at a bulkhead. The seat has additional legroom. There is no floor storage for this seat during takeoff and landing. The tray table and inflight entertainment monitor are in the armrest, making the armrest immovable and slightly reducing seat width. 15 G None No Power Seat 15 G is a standard Premium Economy Class seat located at a bulkhead. The seat has additional legroom. There is no floor storage for this seat during takeoff and landing. The tray table and inflight entertainment monitor are in the armrest, making the armrest immovable and slightly reducing seat width. 15 H None No Power Seat 15 H is a standard Premium Economy Class seat located at a bulkhead. The seat has additional legroom. There is no floor storage for this seat during takeoff and landing. The tray table and inflight entertainment monitor are in the armrest, making the armrest immovable and slightly reducing seat width. 15 K None No Power Seat 15 K is a standard Premium Economy Class seat located at a bulkhead. The seat has additional legroom. There is no floor storage for this seat during takeoff and landing. The tray table and inflight entertainment monitor are in the armrest, making the armrest immovable and slightly reducing seat width. 22 D None No Power Seat 22 D is a standard Economy Class seat located at a bulkhead with additional legroom. There is no floor storage for this seat during takeoff and landing. The tray table and inflight entertainment monitor are in the armrest, making the armrest immovable and slightly reducing seat width. 22 E None No Power Seat 22 E is a standard Economy Class seat located at a bulkhead with additional legroom. There is no floor storage for this seat during takeoff and landing. The tray table and inflight entertainment monitor are in the armrest, making the armrest immovable and slightly reducing seat width. 22 G None No Power Seat 22 G is a standard Economy Class seat located at a bulkhead with additional legroom. There is no floor storage for this seat during takeoff and landing. The tray table and inflight entertainment monitor are in the armrest, making the armrest immovable and slightly reducing seat width. 23 A None No Power Seat 23 A is a standard Economy Class seat located at a bulkhead with additional legroom. There is no floor storage for this seat during takeoff and landing. The tray table and inflight entertainment monitor are in the armrest, making the armrest immovable and slightly reducing seat width. 23 C None No Power Seat 23 C is a standard Economy Class seat located at a bulkhead with additional legroom. There is no floor storage for this seat during takeoff and landing. The tray table and inflight entertainment monitor are in the armrest, making the armrest immovable and slightly reducing seat width. 23 D None No Power Seat 23 D is a standard Economy Class seat with additional legroom however, the alignment of the seat to the one in front may be bothersome. Also, other passengers tend to bump into this seat. 23 E None No Power Seat 23 E is a standard Economy Class seat however, the alignment of the seat to the one in front may be bothersome. 23 F None No Power Seat 23 F is a standard Economy Class seat however, the alignment of the seat to the one in front may be bothersome. 23 G None No Power Seat 23 G is a standard Economy Class seat with additional legroom however, the alignment of the seat to the one in front may be bothersome. Also, other passengers tend to bump into this seat. 23 H None No Power Seat 23 H is a standard Economy Class seat located at a bulkhead with additional legroom. There is no floor storage for this seat during takeoff and landing. The tray table and inflight entertainment monitor are in the armrest, making the armrest immovable and slightly reducing seat width. 23 K None No Power Seat 23 K is a standard Economy Class seat located at a bulkhead with additional legroom. There is no floor storage for this seat during takeoff and landing. The tray table and inflight entertainment monitor are in the armrest, making the armrest immovable and slightly reducing seat width. 28 A None No Power Seat 28 A is a standard Economy Class seat located in the last row of the forward Economy Class section. Seat back recline might be limited due to the lavatory wall directly behind. Also, if the seat back in front is reclined, then there will be a reduction of personal space. The proximity to the lavatories might be bothersome. 28 C None No Power Seat 28 C is a standard Economy Class seat located in the last row of the forward Economy Class section. Seat back recline might be limited due to the lavatory wall directly behind. Also, if the seat back in front is reclined, then there will be a reduction of personal space. The proximity to the lavatories might be bothersome. 28 D None No Power Seat 28 D is a standard Economy Class seat located in the last row of the forward Economy Class section. Seat back recline might be limited due to the lavatory wall directly behind. Also, if the seat back in front is reclined, then there will be a reduction of personal space. The proximity to the lavatories might be bothersome. 28 E None No Power Seat 28 E is a standard Economy Class seat located in the last row of the forward Economy Class section. Seat back recline might be limited due to the lavatory wall directly behind. Also, if the seat back in front is reclined, then there will be a reduction of personal space. The proximity to the lavatories might be bothersome. 28 F None No Power Seat 28 F is a standard Economy Class seat located in the last row of the forward Economy Class section. Seat back recline might be limited due to the lavatory wall directly behind. Also, if the seat back in front is reclined, then there will be a reduction of personal space. The proximity to the lavatories might be bothersome. 28 G None No Power Seat 28 G is a standard Economy Class seat located in the last row of the forward Economy Class section. Seat back recline might be limited due to the lavatory wall directly behind. Also, if the seat back in front is reclined, then there will be a reduction of personal space. The proximity to the lavatories might be bothersome. 28 H None No Power Seat 28 H is a standard Economy Class seat located in the last row of the forward Economy Class section. Seat back recline might be limited due to the lavatory wall directly behind. Also, if the seat back in front is reclined, then there will be a reduction of personal space. The proximity to the lavatories might be bothersome. 28 K None No Power Seat 28 K is a standard Economy Class seat located in the last row of the forward Economy Class section. Seat back recline might be limited due to the lavatory wall directly behind. Also, if the seat back in front is reclined, then there will be a reduction of personal space. The proximity to the lavatories might be bothersome. 29 D None No Power Seat 29 D is a standard Economy Class seat located at a bulkhead that has additional legroom. The proximity to the lavatories might be bothersome. There is no floor storage for this seat during takeoff and landing. The tray table and inflight entertainment monitor are in the armrest, making the armrest immovable and slightly reducing seat width. 29 E None No Power Seat 29 E is a standard Economy Class seat located at a bulkhead that has additional legroom. The proximity to the lavatories might be bothersome. There is no floor storage for this seat during takeoff and landing. The tray table and inflight entertainment monitor are in the armrest, making the armrest immovable and slightly reducing seat width. 29 F None No Power Seat 29 F is a standard Economy Class seat located at a bulkhead that has additional legroom. The proximity to the lavatories might be bothersome. There is no floor storage for this seat during takeoff and landing. The tray table and inflight entertainment monitor are in the armrest, making the armrest immovable and slightly reducing seat width. 29 G None No Power Seat 29 G is a standard Economy Class seat located at a bulkhead that has additional legroom. The proximity to the lavatories might be bothersome. There is no floor storage for this seat during takeoff and landing. The tray table and inflight entertainment monitor are in the armrest, making the armrest immovable and slightly reducing seat width. 30 A None No Power Seat 30 A is a standard Economy Class seat located in an Exit Row. The seat features additional legroom, however, part of the legroom might be reduced due to the protrusion from the exit door. The tray table and inflight entertainment monitor are installed in the armrest, therefore, the armrest is immovable and seat width is slightly reduced. Floor storage for personal effects is not available for use during takeoff and landing. The proximity to the lavatory area might be bothersome. 30 C None No Power Seat 30 C is a standard Economy Class seat located in an Exit Row. The seat features additional legroom, however the proximity to the lavatories may be bothersome. 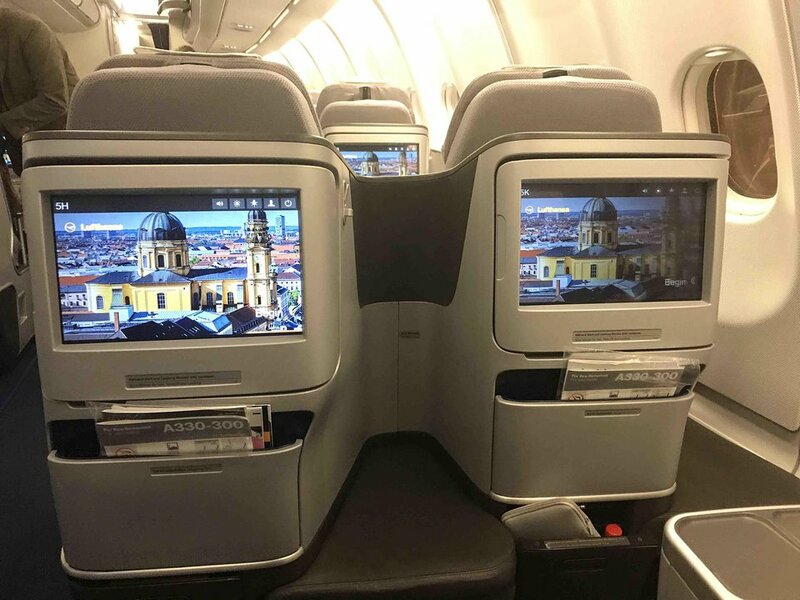 The tray table and inflight entertainment monitor are installed in the armrest, therefore, the armrest is immovable and seat width is slightly reduced. Floor storage for personal effects is not available for use during takeoff and landing. 30 H None No Power Seat 30 H is a standard Economy Class seat located in an Exit Row. The seat features additional legroom, however the proximity to the lavatories may be bothersome. The tray table and inflight entertainment monitor are installed in the armrest, therefore, the armrest is immovable and seat width is slightly reduced. Floor storage for personal effects is not available for use during takeoff and landing. 30 K None No Power Seat 30 K is a standard Economy Class seat located in an Exit Row. The seat features additional legroom, however, part of the legroom might be reduced due to the protrusion from the exit door. The tray table and inflight entertainment monitor are installed in the armrest, therefore, the armrest is immovable and seat width is slightly reduced. Floor storage for personal effects is not available for use during takeoff and landing. The proximity to the lavatory area might be bothersome. 4 C None No Power Seat 4 C is a standard Business Class seat that transforms into a fully flat bed. 4 H None No Power Seat 4 H is a standard Business Class seat that transforms into a fully flat bed. 40 D None No Power Seat 40 D is a standard Economy Class seat that juts into the aisle and is often bumped into by other passengers and crew. 40 G None No Power Seat 40 G is a standard Economy Class seat that juts into the aisle and is often bumped into by other passengers and crew. 41 D None No Power Seat 41 D is a standard Economy Class seat however, the alignment of the seat to the one in front may be bothersome. 41 E None No Power Seat 41 E is a standard Economy Class seat however, the alignment of the seat to the one in front may be bothersome. 41 G None No Power Seat 41 G is a standard Economy Class seat however, the alignment of the seat to the one in front may be bothersome. 46 A None No Power Seat 46 A is a standard Economy Class seat located in the last row of the aircraft. Seat back recline might be limited due to the wall of the lavatory directly behind. Also, if the seat back in front is reclined, then there will be a reduction of personal space. The close proximity to the galley area might be bothersome. 46 C None No Power Seat 46 C is a standard Economy Class seat located in the last row of the aircraft. Seat back recline might be limited due to the wall of the lavatory directly behind. Also, if the seat back in front is reclined, then there will be a reduction of personal space. The close proximity to the galley area might be bothersome. 46 D None No Power Seat 46 D is a standard Economy Class seat located in the last row of the aircraft. Seat back recline might be limited due to the wall of the lavatory directly behind. Also, if the seat back in front is reclined, then there will be a reduction of personal space. The close proximity to the galley area might be bothersome. 46 E None No Power Seat 46 E is a standard Economy Class seat located in the last row of the aircraft. Seat back recline might be limited due to the wall of the lavatory directly behind. Also, if the seat back in front is reclined, then there will be a reduction of personal space. The close proximity to the galley area might be bothersome. 46 G None No Power Seat 46 G is a standard Economy Class seat located in the last row of the aircraft. Seat back recline might be limited due to the wall of the lavatory directly behind. Also, if the seat back in front is reclined, then there will be a reduction of personal space. The close proximity to the galley area might be bothersome. 46 H None No Power Seat 46 H is a standard Economy Class seat located in the last row of the aircraft. Seat back recline might be limited due to the wall of the lavatory directly behind. Also, if the seat back in front is reclined, then there will be a reduction of personal space. The close proximity to the galley area might be bothersome. 46 K None No Power Seat 46 K is a standard Economy Class seat located in the last row of the aircraft. Seat back recline might be limited due to the wall of the lavatory directly behind. Also, if the seat back in front is reclined, then there will be a reduction of personal space. The close proximity to the galley area might be bothersome. 5 C None No Power Seat 5 C is a standard Business Class seat that transforms into a fully flat bed, however, the proximity to the galley and lavatory area may be bothersome. 5 D None No Power Seat 5 D is a standard Business Class seat that transforms into a fully flat bed, however, the proximity to the galley and lavatory area may be bothersome. 5 G None No Power Seat 5 G is a standard Business Class seat that transforms into a fully flat bed, however, the proximity to the galley and lavatory area may be bothersome. 5 H None No Power Seat 5 H is a standard Business Class seat that transforms into a fully flat bed, however, the proximity to the galley and lavatory area may be bothersome. On board Wi-Fi is available in all classes via FlyNet®. The free FlyNet® portal also offers live TV channels, news and other services. Charges for internet usage apply and can be purchased by credit card or by redeeming Miles & More reward miles via your laptop, tablet or mobile device. For further information please visit: lufthansa.com/FlyNet. 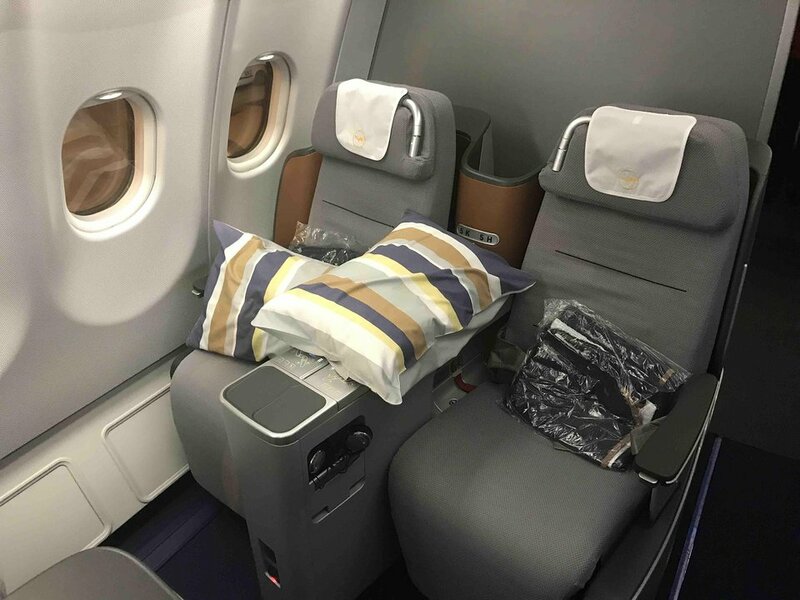 This aircraft is operated in a three class configuration with 42 flat bed Business Class seats, 28 Premium Economy seats, and 185 standard Economy seats. There is no wall behind this seat, hence you have full recline. Seat is anyway awful, every second minute a flight attendant bumps into you. Light is on in the galley an curtain open all night, noise level from galley is disturbing all night, as crew is chatting. Only positive aspect is that seats 45H/K and 46H/K have individual air vents, area is obviously sometimes used as crew rest area, there are attachments for a curtain behind row 44. This was a great economy seat for an 8.5 hour flight. I'm 6'2" and 205 and felt that it was wide enough. The legroom was incredible. It looked to me to be a better option than the people right in front of my in PE. I thought that Lufthansa service, food, and beverage were better than I have experienced on several other airlines. Literally the most uncomfortable seat cushion Ive ever sat on except maybe a coach seat on AirChina which I think was made of straw and feathers. In the reclined position the bed was so narrow you couldnt fully bend your knees if youre a side sleeper. And it is not fully flat - you slide down somewhat (though not quite as much as much like AAs vintage sliding boards). No personal ventilation - a huge pet peeve of mine especially as many European and middle eastern countries tend to run warmer than we Americans. No storage other than a small awkward plastic bin with - whats that inside - is it a plastic bag? A poncho? No its the amenity kit which did not even contain the earplugs that could have come in handy for the two businessmen in front of me talking and laughing loudly the entire 9 hours. The ice cream after dinner wasnt even plated in glass dish ware, though I suppose I should be grateful they peeled the plastic lid off for me. Appetizer nuts were served cold and overall the food was disappointing and tiny portions. The saving grace? I found a good Australian red wine. What happened to great German design and engineering? So many misses and cost-cutting moves here it was truly unfortunate. But the worst part was definitely the seat cushions  terribly uncomfortable. Avoid at all costs! General review for this plane. Too few restrooms in Economy. None at the back of the plane means impossible to use restroom if carts are in the aisle. Plus of course, lines. Second service, deceptively advertised as "second meal", consisted of microscopic and tasteless sandwich. Bad seat (Applies to all Y "A" seats). There are large electronic boxes protruding into the leg space. As a result, it is impossible to stretch one's legs straight; you must have a skewed position, leaning to the right. One day llater, I still feel a pain in my left leg. Also, your left leg will rest on the box increasing the pain. I had to put a pillow between my leg and th ebox to smooth the contact. These boxes are an embarrasment on the part of the airlines, in this case LH, who clearly do not care about passengers' comfort -- and health. These seats should all be yellow. If traveling as a couple, be sure to get D-G in business. Window passengers must climb over the aisle passenger to reach the aisle. On the plus side, the A-C and H-K seats have slightly more space in the foot wells when fully reclined. The D-G seats are a smaller wedge design for your feet and a bit cramped. Outatanding legroom for an economy seat (even if premium). The flight was Munich to Washington-Dulles. It's a middle seat in the back of the plane, so I wasn't expecting too much. The overhead bins were rather small in my opinion but I didn't have a carry-on except for a backpack so it fit just fine. I found the seat itself wasn't all that comfortable personally but my wife said she thought it was fine. The IFE was good in that it had lots to choose from and the screen was very responsive, unlike other IFEs where you touch it and nothing happens. The crew was very nice and helpful. Since I was in the second to last row, they ran out of the chicken entree but I got the beef entree from first or business class (she said it's was from the front of the plane) so that was nice even though I thought it was just okay. The bathroom is your typical bathroom in economy class. One nice thing about being that far back is that the galley is right behind you and when the crew is either serving the front rows of economy or when they're done, you can walk around behind the last row of seats from one aisle to the other for a little extra exercise and not bother anyone. I like Lufthansa's PE seating, when it's not too costly. There is one major problem for travelers in window seats in PE. If the person in front of you fully reclines his seat, there is literally no way to get out of the window seat, like to use the restroom. I measured five inches between the reclined seat back and the center arm rests. A contortionist could do it, but not a person with a normal body. I do enjoy that recline, but now I know what it does to the person behind me. The seat is one of the best in coach. The protrusion is about 1m away, it doesn't bother at all. Also, this seat guarantees plenty of legroom. I travel quite a bit - chairman on AA - the pitch in economy is absolutely horrible. The gent in front of me reclined (can't blame him) and at 6'ft, could not move my legs. luckily on the aisle. But for a 10+ hour flight, I hope the FAA could put some sense into this. Good luck! We had booked 23H+K and 22G. They are extraordinarily good seats for economy.Definitely worth the extra money. My husband is 6`3/1.90m and was able to stretch out his legs completely. Service was good on this flight,food was good,butnot enough to really satisfy. Very spacious lavatories. I had paid extra for this seat from Vancouver to Munich and it was worth every cent. The legroom was huge, only one passenger beside me on the window seat and he could easily get up and step past me to go to the restroom even during the dinner service when the tray was up. There is no bulkhead, just a small dividing screen on the ceiling between this row and the next which is premium economy. Therefore the passengers in these seats are first to be served in the whole economy section. A very spacious feel in this area. The restrooms are nearby behind but not close enough to be bothersome. Would recommend this seat for long haul especially. The business class seats are truly horrible. The absolute worst of any star alliance airline. I am not a big person. Just 5'8" in height and average build. I tried every position but could not get comfortable enough to sleep. I do a 100K miles a year so i tend to sleep well on planes. Not in these business class seats. Add to this, some terrible food, and that just about sums up my Lufthansa business class experience on the A330. Flight LH 494 from Munich to Toronto in Economy. Aircraft registration was D-AIKB. This was my first experience flying long-haul on Lufthansa and overall it was a very good experience. The location of this seat was great as it is close enough to the lavatories but not close enough to be bothersome. The seats were comfortable, the food was very good, the in-flight entertainment system worked well and the flight attendants were excellent.